The Kingdom of Sautrest has been beaten battered and bruised, as they suffer under an internal power struggle, one that has lasted for months and has embroiled countless clans. This power struggle has once again reared its ugly head, just while the Kingdom was beginning to find its footing. The Power of 10—once the dominant force within the land, and who were only recently overtaken by the Hostile Takeover Order who displaced them as the rulers of Kingdom and surpassed them in influence—are beginning to fight back. Their recent drop in standing was not taken lightly by many within the Power of 10 and for a month, they battled on, enriching themselves and growing their armies, to the point where they have once again overtaken the Hostile Takeover and now reside as the Stewards of Sautrest again. 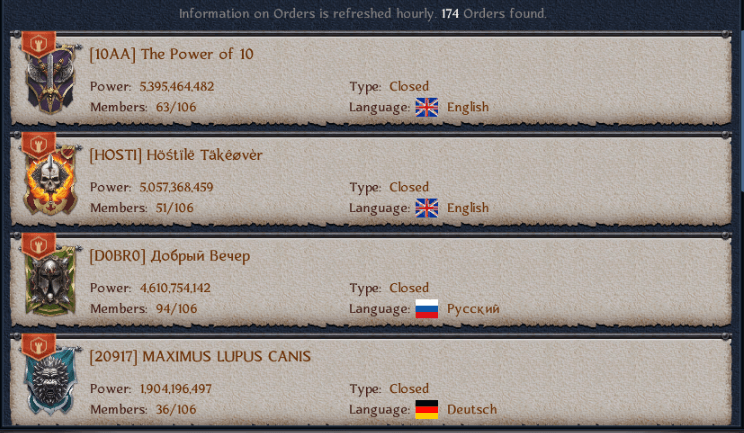 Sadly, many innocent clans have felt the damage of these battles and have been made victims of the top ranking Orders, as they plunder and pillage their towns, hoping to gain influence at their expense. Still, Sautrest is a noble and proud land, one that has fought many battles, some of which have been won, and others which they have not. Fortunately, it appears that this most recent power struggle has not stopped them entirely, as they shambled together a collective force in an attempt to not only repel but overpower the Kingdom of Saint-Dery, which they now find themselves in direct opposition with. Although currently ahead of Saint-Dery, Sautrest could easily fall behind and all citizens are working overtime to ensure that they remain ahead, defeat their foes and claim the riches that come along with this much needed victory. 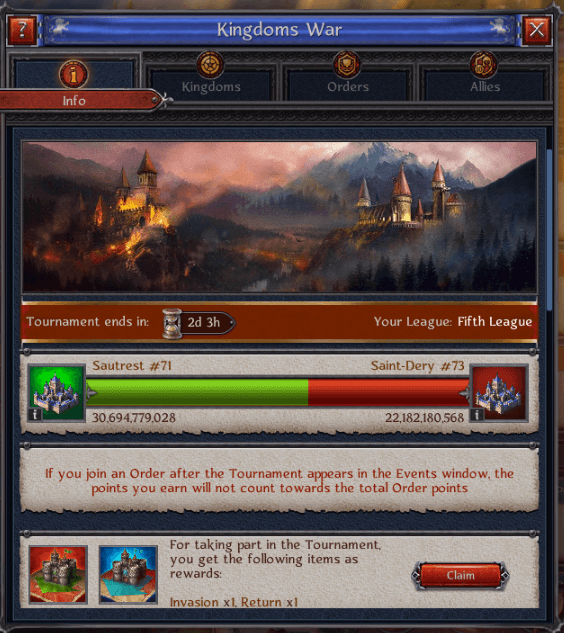 Even though Sautrest is currently winning this battle, the internal struggles which have wracked the Kingdom have taken a toll, as can be seen from their league standings within this Kingdom vs Kingdom global event. 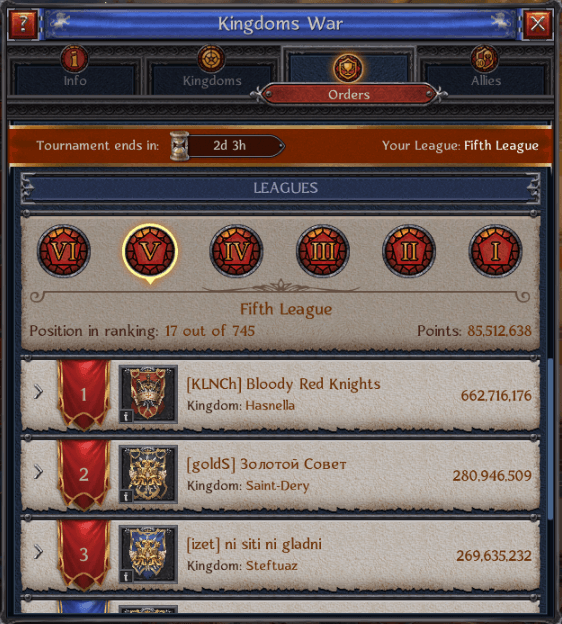 The Bloody Red Knights, who are currently in first place within this event have a stunning 662 million points, while Sautrest, who are in the same league as this Kingdom, have a mere 30 million. A huge gap, one that is not going unnoticed by some. Still, we have hope for this Kingdom and know that it will continue to grow, especially if the citizens of the lands can get over their petty differences and join forces together, becoming the strong and formidable force that we here at the Chronicles know they are. Press on Sautrest and fight on, your enemies await thee!